Yummy, Low Calorie Diet Food -- Plus Where to Buy! : Nesquik - A Low Calorie Chocolate Favorite - And Still Healthy! Nesquik - A Low Calorie Chocolate Favorite - And Still Healthy! 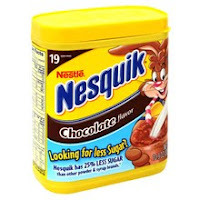 A childhood favorite that you likely buy for your kids is actually one of the yummiest diet foods out there – Nesquik. The familiar powder that you likely mixed up in your milk as a kid is not only free from trans-fats and saturated fat, but it is also cholesterol-free and is vitamin-enriched with Vitamins C, D, B6, Zinc, Copper, Manganese, Iron and Calcium. And unlike most hot chocolate mixes, Nesquik is totally free from artificial ingredients and the other unpronounceable ingredients you find in so many other low calorie chocolate foods. So it is both yummy and good! I like to mix up two tablespoons of Nesquik in one cup of low calorie almond milk or low calorie coconut milk. You could also try mixing it with coconut water, although I haven't tried that yet. You can drink it hot or cold, depending on your mood. Nesquik is available in chocolate (my favorite), strawberry, and vanilla (which I haven't tried - let me know if they are good!). Two tablespoons of Nesquik powder has just 60 calories (and 1 weight watchers point). I found a great recipe that I enjoy on the Nesquik site, and I have modified it to make it even healthier for dieters. This cool smoothie makes a great breakfast meal, a low calorie dessert, or can be used as a snack – and what’s more – your kids will drink it! My modified version of the “Bunny Safari Smoothie” provides you with lots of Calcium, Vitamin C, and Potassium – and will hit the spot on a hot summer’s day! Place almond or coconut milk, bananas, ice and Nesquik in blender; cover. Blend until smooth. For a Chocolate Peanut Smoothie, blend the above with one tablespoon of Better’n Peanut Butter or PB2, which are both healthy, low calorie peanut butter alternatives. Or for a berry smoothie, blend in 1 cup of frozen strawberries or raspberries (or throw in a handful of cherries or blueberries) in place of bananas. I have all of these ingredients at home. Greedy Baby would enjoy this! Do you know what the point value is on this? Are you still doing weight watchers? Thank you so much, I really enjoy your blog and it is so helpful! !